It all started with the Vision 2030 unveiling on 10 June 2008. Many of the Kenyans were curious if the nation could achieve the goals it had set when the President announced about the initiative. It has been a dream back then but now it was turning to be a reality as projects are being finished and unveiled to the public; an example is the Thika Road project which started earlier last year. Back home in Kibera it was the Kibera Slum Upgrading program which many people were heard saying Kibera ni kubwa sana haitamalizwa kujengwa (Kibera is too big to be fully constructed). Which we are yet to see! In various parts of Kibera you will find big holes dug by the road side. These are drainage tranches which will help ease the drainage system in Kibera. Drainage has been a very key issue in the region for the area is full of small drainage streams which lead to the 3 rivers which pass through Kibera. These drainage streams are usually dirty and sometimes causes diseases to the residents. – Keeping a clean environment. The idea of the Government is to complete most of the roads by June 2013. This has seen road construction project brought forth also here in Kibera. The southern bypass which is a big project in itself passes through Kibera and it will benefit Kiberians in one way or the other. Another Project is the Makina to Highrise road which will pass through Lindi and the DC to Highrise road which will pass through Mashimoni. These are some of the project to be constructed to achieve the Governments goals. The Mashimoni road just kicked off after the completion of laying the drainage pipes. Some kiosk owners who were doing business by the road side had to move their kiosks or demolished their residents after the road was marked ready for constructions. Many projects have started and this has seen youth from Kibera get employment. 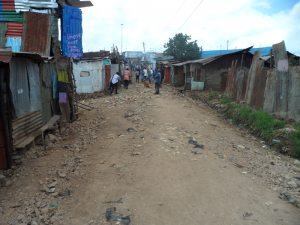 “This is where I get bread”, says Said who works with the road constructions in Kibera. Many youths from a certain region get to work on a project once it get to that particular place. It is usually hard to get people from a different place working in another region hence the employers pick youth according to the area or village. We the people of Kibera hope to see the completion of the projects and which will help the people of Kibera. It will all go down to the next president to continue from where President Kibaki has left. Indeed the vote of the people Kibera will decide if the projects end in time or see what we have experienced in the past. The decision is in the people’s hands. This entry was posted in Empowerment, Environment, Kibera, People, Uncategorized, Youth and tagged Constructions, Development, Kibera, Ministry of Roads and Housing, Roads, Upgrading, Vision2030. Bookmark the permalink.